I was never exactly a baby person, I never carried any of my cousin’s babies, mostly due to the fear that I would drop the baby. With kids I only do the habitual pat on the back or the pinch of the cheeks and ask them what they are studying(which is easier with babies coz I can skip the question :P ) But with my niece things were so different from the first moment I saw her. That day had already been a pretty crazy day, I was woken up by my mom to tell me that my sis was feeling some labor pains. My dad drove them to the hospital and my mom called me at regular intervals to give me updates. I stayed back so that I could help out my grand mom. By noon the doctor had said that the baby is expected by the evening. I went over around lunch and met my parents, brother in law, sister’s in laws and a few other relatives at the hospital. I was at the hospital till about 4 pm, then my brother in law asked me to go back home as the baby was not expected till later in the evening and all we were doing was staring at the wall. I always knew my sis was a brave soul but that day I truly realized how strong she was. It was amazing how she took the contractions from labor without screaming even once. My mom was amazed by her ability to hold back pain and told me about when she was in labor and how much she had screamed. Its these moments that sometimes bring back the truth into your head that you grew for nine months inside your mother… I gave her a hug. I decided that the right thing to do was to head back home and check on grandma. But as the twist of fate would take it, my niece was born at 4:44 pm. I got the message of her imminent arrival as soon as I reached home and headed right back to the hospital. The moment I walked in the room was empty and then the nurse brought the baby into the room. Its hard to explain the emotions that went thru my mind as I saw her for the first time. She was the most beautiful fragile person I had ever seen. This was the first time I had seen a baby that was born less than five minutes ago. The baby was wide eyed and stared at the world around her. She was unusually quiet for the first few hours and I just spent most of the time just looking at her. The biggest lesson my niece has taught me is about love. I always wondered what selfless love was and if it was possible… When you truly care for a baby the understanding of love is just too obvious. 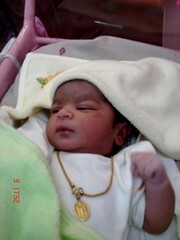 This entry was posted in Family, Photo, Special Days and tagged baby, birth, Family, Hospital, life, love, Niece, Nurse, sister. Bookmark the permalink.